STEM, the integrated study of science, technology, engineering and mathematics, has become one of the hottest buzz words in education over the last few years. And for good reason! The disciplines covered in STEM are some of the most important for students in today’s technological world. Students need experiences with engineering and technology to help prepare them for success, including in the workforce of the future. Engineering, a core area of STEM, builds on kids’ natural problem-solving skills. Good STEM projects with strong engineering components are great ways of developing future generations of critical thinkers. Including engineering projects into formal education helps promote ‘engineering habits of mind’ such as systems thinking, creativity, collaboration and communication. Not to mention, these types of projects are brilliant good fun! Can Edison be used for educational engineering? 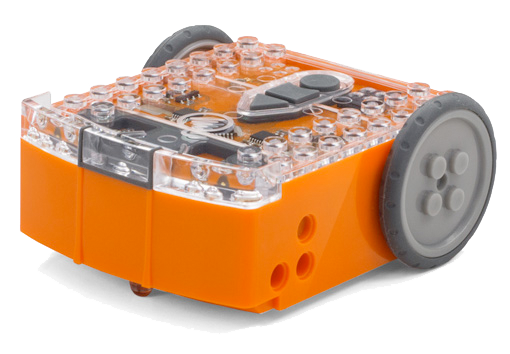 Because Edison robots work with any LEGO brick compatible building system, the robots are the perfect programmable base for all types of creative physical engineering projects. Edison can be used as a ‘building base’ as bricks can be attached to the top and bottom of the Edison robot and pegs can be attached to the robot’s sides. Remove Edison’s wheels and use cross axles in the powered sockets instead to create all manner of moving designs. This flexibility, combined with the fact that Edison can be programmed using multiple different languages, makes Edison a great platform for creating, building and inventing. And now that is easier than ever before. 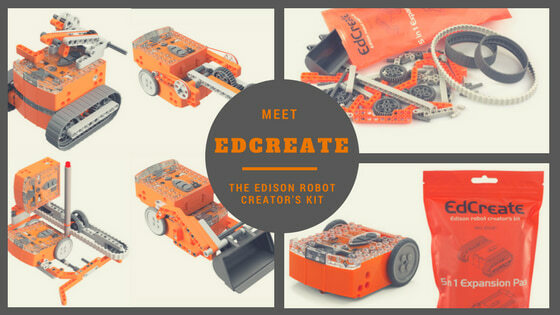 EdCreate is a 5-in-1 expansion pack construction system specifically designed to work with the Edison robot. EdCreate makes it easy to enrich students’ STEM education experience through interactive engineering and programming projects. The EdCreate Edison robot creator’s kit is a construction system consisting of 115 interlocking building blocks, pegs, gears, and other parts. The individual EdCreate pieces contain studs and holes which are compatible with Edison robots and any other LEGO brick compatible building system. These five projects require progressive levels of engineering understanding and coding capabilities, making them a perfect addition to the Edison programming and robotics curriculum. Step-by-step instructions are available for each build, allowing any student to complete the projects, regardless of previous experience with physical engineering projects. EdCreate is also the perfect building set for a wide range of open-ended engineering, design and programming projects, including the EdCreate EdChallenges. With no set solutions, open-ended projects, including the EdCreate EdChallenges, promote creative problem solving and give students opportunities to find STEM applications to real-world scenarios. These challenges require lots of creativity, even if the actual challenge is something as simple as attaching a pen to an Edison robot. The available teacher’s guide to EdCreate complements the EdCreate EdBuilds and EdChallenges. This guide provides teachers and instructors with supplementary supporting information about the EdBuild projects, activity extension ideas, programming projects, and further information on using EdCreate in the classroom environment. EdCreate kits are a brilliant addition to your STEM educational arsenal. Each kit can be used to create all five of the different EdBuilds and any number of other open-ended challenges. You can also expand the kits can with other LEGO brick compatible building system parts. EdCreate is now available through the Edison online store. Single packs, class packs and STEM packs with both EdCreate and Edison robots are all available through both the online store and many Edison distributors. The how-to instructions for the EdBuilds, the teacher’s guide and the EdCreate EdChallenges are all free to download. Where will your EdCreate EdVenture take you? We’d love to see what you engineer! Send us your ideas, pics and videos at social@microbric.com or add them to the online community of Edison awesomeness on Pinterest, Facebook, Twitter, Instagram or YouTube.